Explanation: Two dark shadows loom across the banded and mottled cloud tops of Jupiter in this sharp telescopic view. In fact, captured on January 3rd, about a month after the ruling gas giant appeared at opposition in planet Earth's sky, the scene includes the shadow casters. Visible in remarkable detail at the left are the large Galilean moons Ganymede (top) and Io. With the two moon shadows still in transit, Jupiter's rapid rotation has almost carried its famous Great Red Spot (GRS) around the planet's limb from the right. 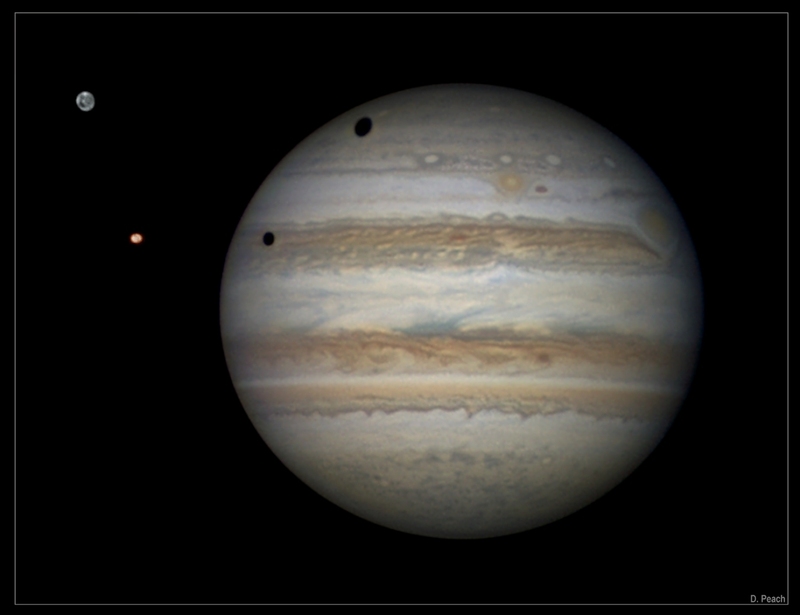 The pale GRS was preceded by the smaller but similar hued Oval BA, dubbed Red Spot Jr., near top center. North is down in the inverted image.